Limoncello with tea spells refreshment no matter how you mix it. Here are a few recipes to add to your cocktail repertoire. If you've never had limoncello before, you owe it to yourself to give this delicious liqueur a try. It's made from lemon rinds, vodka and sugar.The drink is a popular tradition in Italy where it's usually sipped from a special shot glass after dinner. Enthusiasts recommend chilling your limoncello in the fridge beforehand, and you should chill the glasses you plan to serve it in too by putting them in your freezer for at least one hour before you plan to use them. This popular liqueur goes incredibly well with both hot and cold tea. Give the following recipes a try and see if you agree. Feel free to add some sugar or simple syrup if you'd like your beverage to be a little sweeter. Add 2 ounces of cranberry juice to the liqueur before you add the tea. Add 1 or 2 ounces of freshly squeezed orange juice to your liqueur and tea combo to make it extra citrusy. Add some freshly crushed raspberries and blueberries to the original recipe. When the weather turns chilly, try spiking a cup of hot tea with 1 ounce of limoncello liqueur. You can use black, green or even rooibos tea, but also try it with your favorite fruit tisanes, like apple, orange or pomegranate. You can always add a little honey, sugar or simple syrup if you prefer your tea extra sweet. In a highball glass, combine the following ingredients over ice for this updated version of an Arnold Palmer cocktail. 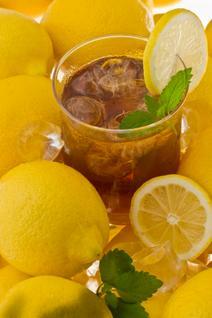 Give the drink a gentle stir, garnish the glass with a slice of fresh lemon and enjoy. Try this different twist on a traditional favorite. In a tall glass, combine all of these ingredient with ice. As you can see, there are numerous ways to mix limoncello with tea to create a fabulous cocktail flavored with the distinct tang of lemon. Don't be afraid to do a little experimenting on your own.